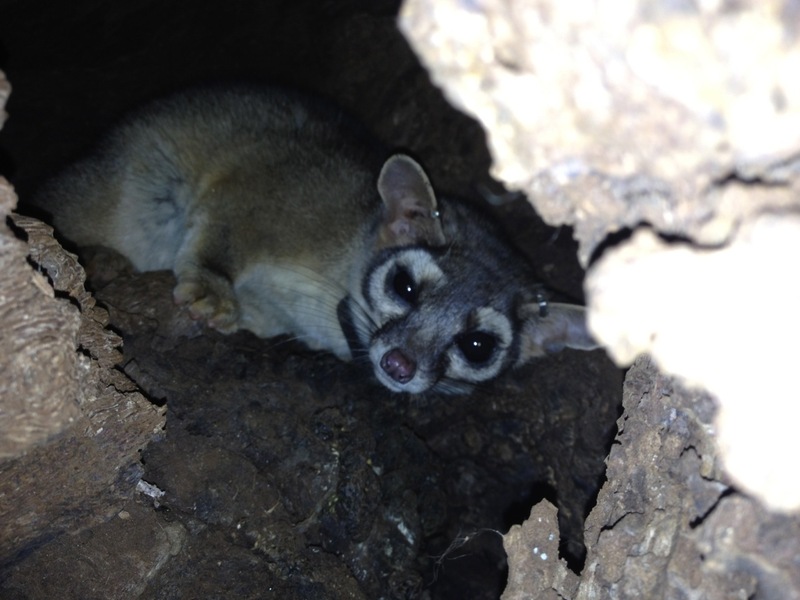 Thank you for visiting this webpage showing videos of a ringtail maternity den. 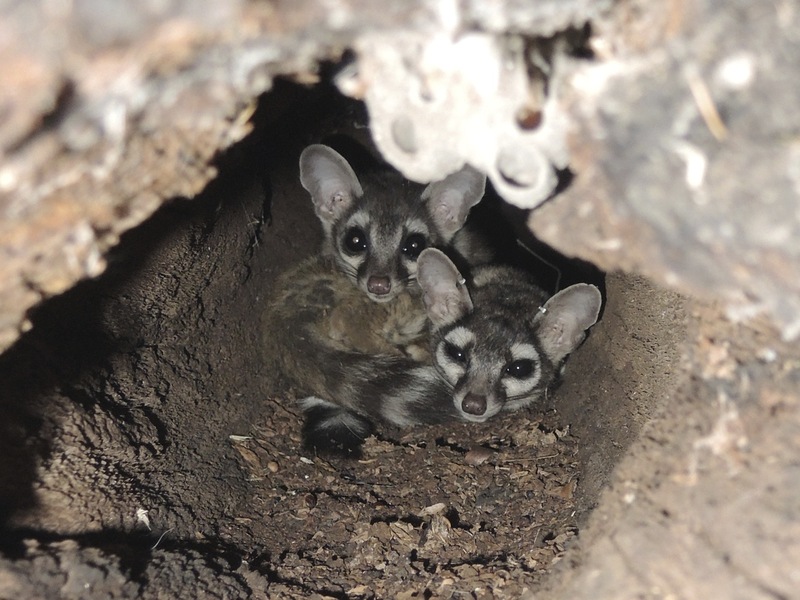 Be sure to scroll down to see pictures of the ringtails being highlighted, but most importantly, for the videos taken from inside the maternity den…and showing the baby ringtails – yeah, they are amazingly cute!!! This is the maternity den for a ringtail that I call “Sally”. She was originally captured on 18 February 2013 and was tranquilized on that date to take body measurements and to attach a radio-transmitter collar around her neck. 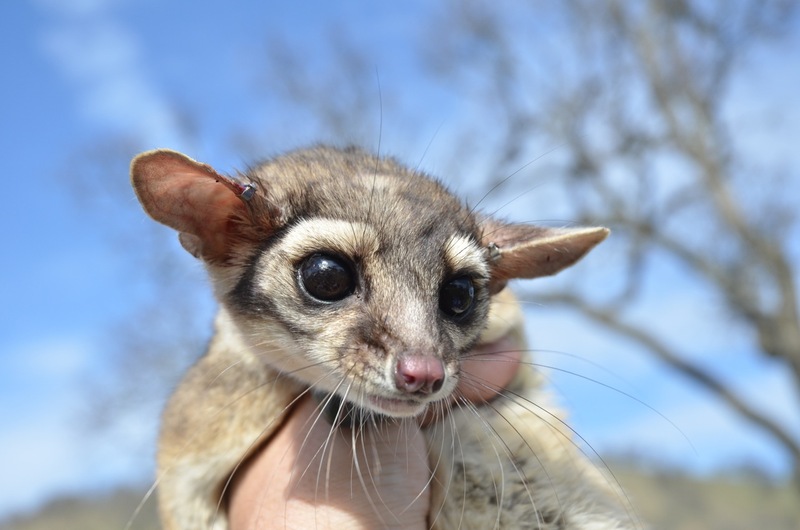 She is a young adult female ringtail who has been a wonderful research partner and I owe her a tremendous debt of gratitude. I am holding a tranquilized Sally. Sally shortly after being released after getting her radio-transmitting collar. 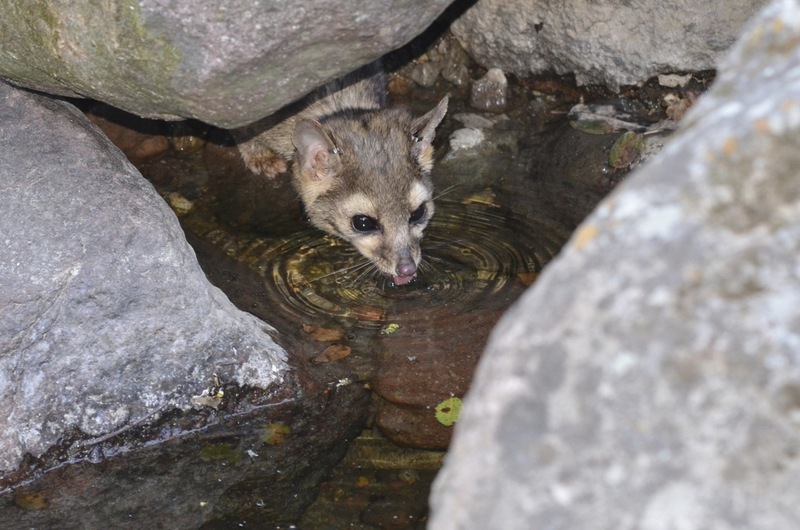 Another ringtail (a male) was captured in close proximity to Sally and he ended up with the name “Don”. Throughout the radio-telemetry work, Don was found in close proximity to Sally and I believe that Sally and Don were likely a reproductive pair. Sadly, Don ended up feeding a predator (I end up having mixed feelings about this because predators have to eat too…and ringtails are part of that food web). However, perhaps the ringtail youngsters you’ll see in the following videos received half of their DNA from Don. Here is Don shortly after being released after receiving his new radio-transmitting collar. Don getting a drink of water after recovery from being tranquilized. 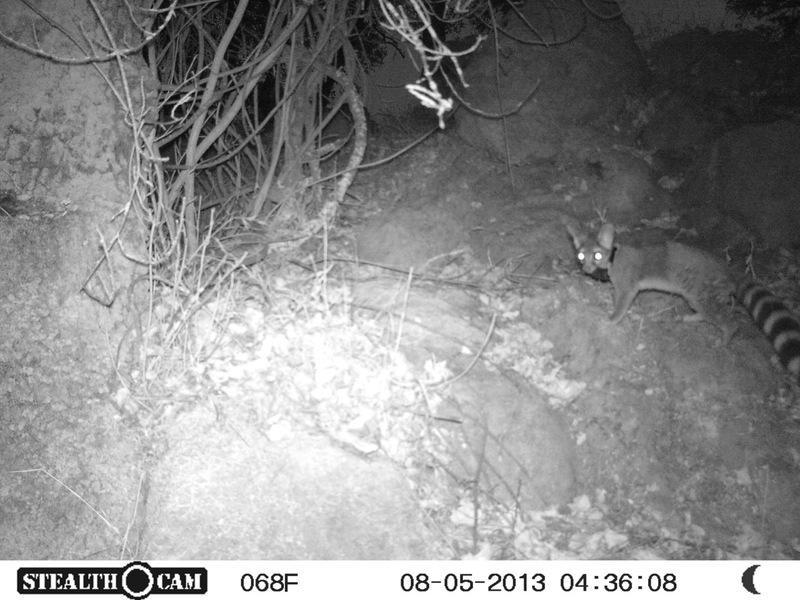 Ringtail Den (Sutter Buttes) 23 June 2013 – At least two juvenile ringtails are present with one of the young ringtails seen here nursing on mom. The den site is located in a hollow at the base of a blue oak (Quercus douglasii). This oak is about 20-inches in diameter at its base and the ringtails are located about 18-inches below the opening. In this video, you can see the young ringtail actively nursing (the mothers left hind foot is visible above the youngster. 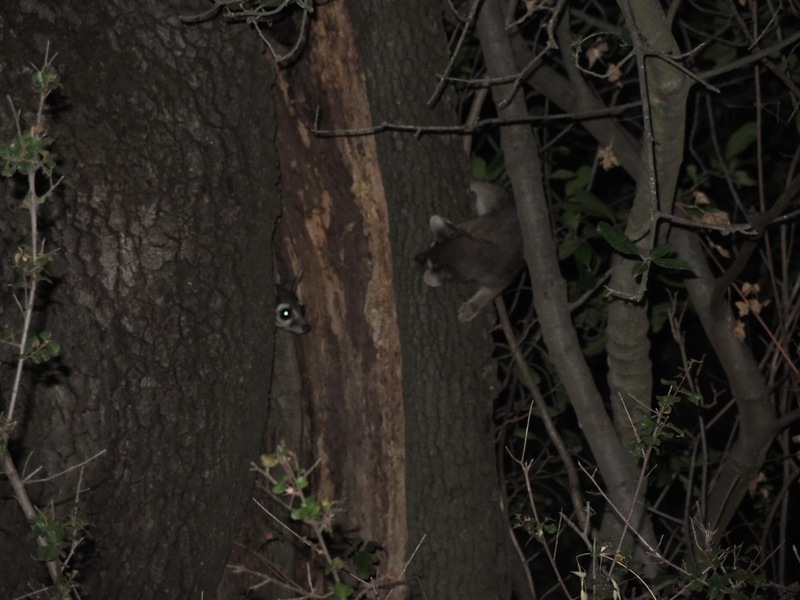 As the juvenile ringtail shifts position later in the video, you can see the flash of pink – this is the teat the ringtail where the juvenile was nursing. This video were taken by David Wyatt using a flashlight for illumination and an iPhone 4s. The next several videos were all taken with a borescope (a camera with a long flexible tube with a camera lens at the end of the tube – they are often used to examine the interiors of engines, such as through the spark plug holes). 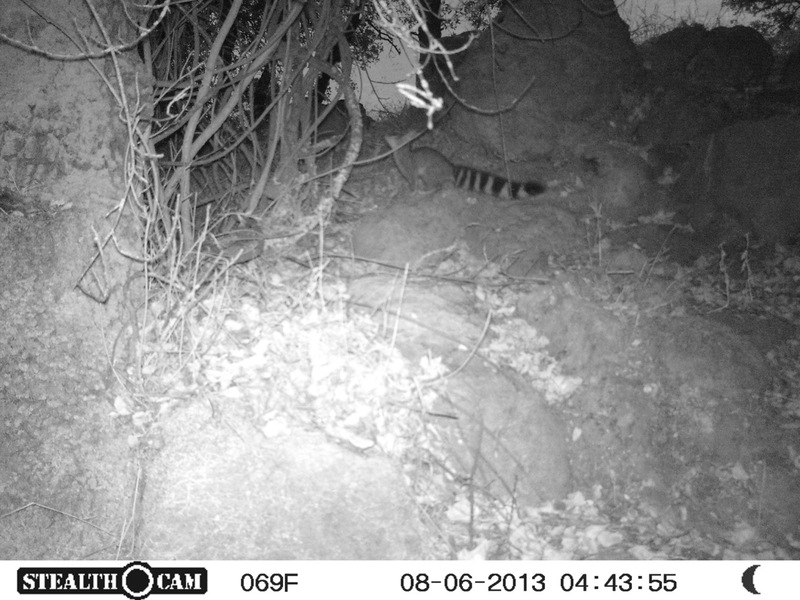 This video was taken on 26 June 2013 and shows one of the two baby ringtails as it lies on it’s back. 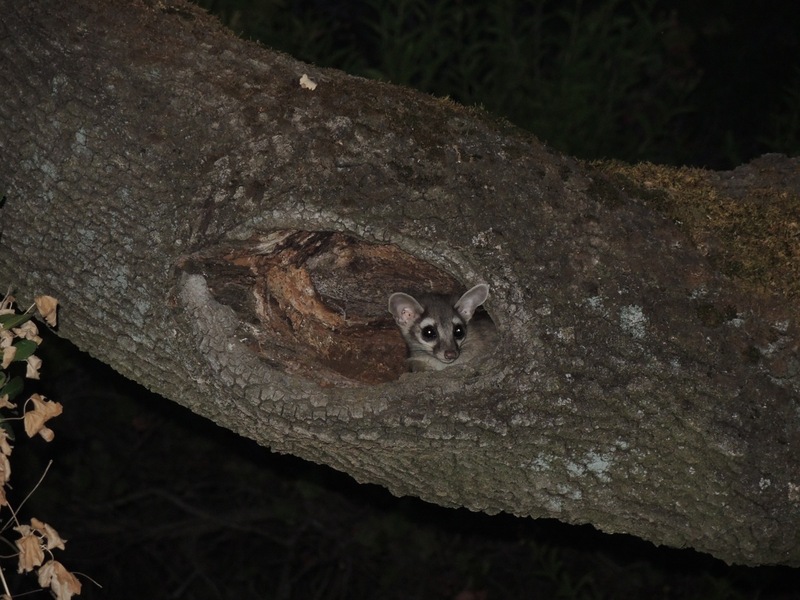 Here is another video also taken on 26 June 2013 that shows one baby ringtail on it’s back (this one has it’s left front foot held up where you can easily see the paw pads). 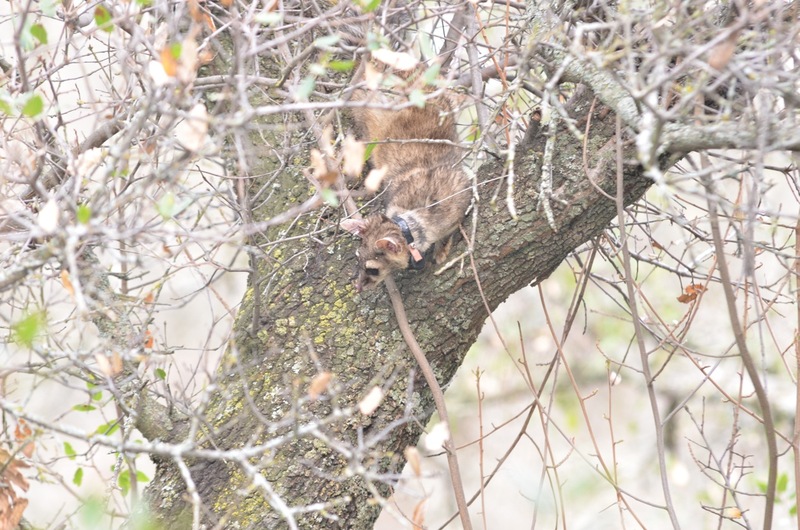 A second ringtail kit is seen on top of the ringtail on it’s back. Here is a remarkable video taken of one of the ringtail kits as it stretches and yawns in the den. This video was taken during the daytime on 29 June 2013. Sally (mom) can be seen at the right side of the screen. Notice how much larger she is than the kit. The kit appears to be approximately four weeks old in the video. Yes, there is a tremendous “aaahhhh” factor with the kits! This next video was taken on the night of 29 June 2013 after Sally had left the den to forage for food. Here are the two kits curled up together. The kit in the middle is more active of the two and does some really nice (tongue extending) yawns and stretches. This video is a continuation of the previous video and shows the two kits curled up together in the den. More stretching after starting out with a big yawn. Another continuation of the above two videos but with a closer angle on the kits. This is an amazing video of two ringtail kits nursing on “mom”. This video was taken during the daytime of 29 June 2013 and first shows one of the ringtail kits nursing on Sally (note the suckling motion on the mouth and the kneading of the front paws). About halfway through the video the other kit makes an appearance and also starts to nurse. Another video with more nursing action from the same afternoon as the previous video. Here both ringtail kits are shown nursing on Sally. Lots of kneading going on here too. And, a last nursing video that is a continuation of the last video. It’s been a bit of time since I last updated this page. But, you might be wondering what happened to Sally and her young. I was able to go back out to the site in August and tracked Sally to a den site different than where the “kits” were born. This time she was in an Interior Live Oak that had quite a covering of poison oak. Sally was in her den and we tracked her to this den on August 4, 2013. I set up a couple of IR cameras and got these pictures from August 5, 2013…. This is Sally coming out of her den (she’s in the top left corner of the photo). This is Sally coming back to her den during the early morning hours. 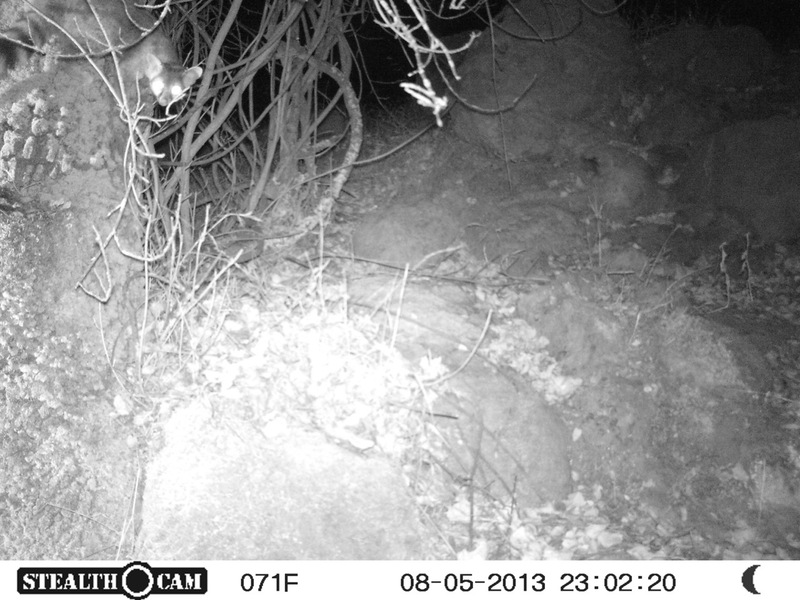 The next night (6 August 2013), the cameras caught one of the youngsters and Sally returning to their den site…. 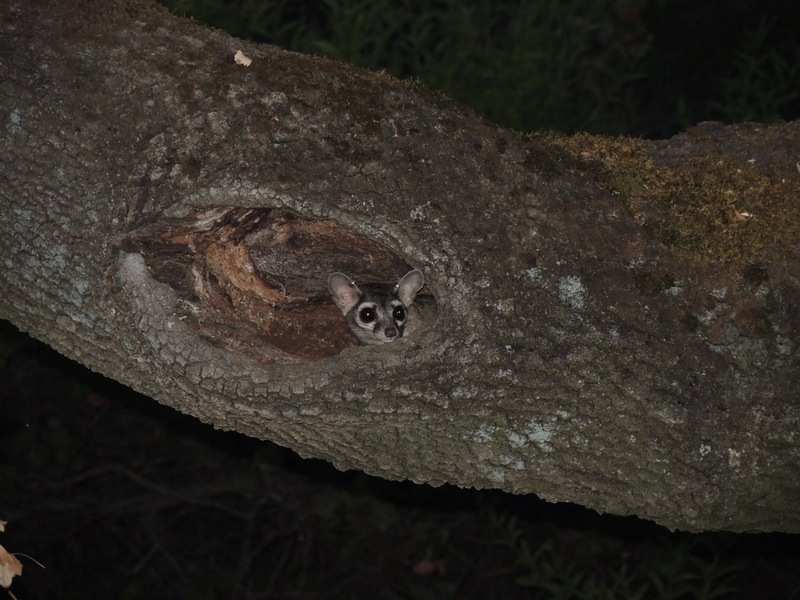 Here is a photo of one of the baby ringtails getting ready to jump up to it’s den. 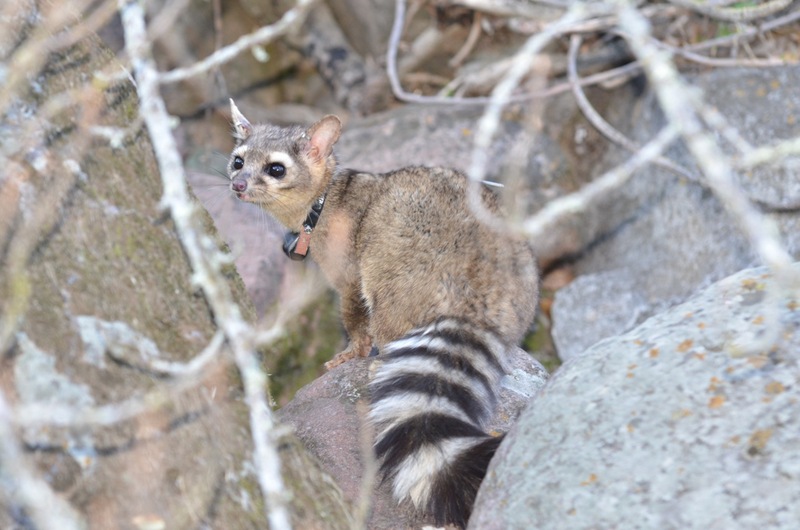 The baby ringtail was quickly followed by Sally – here distinguishable by her radio collar. 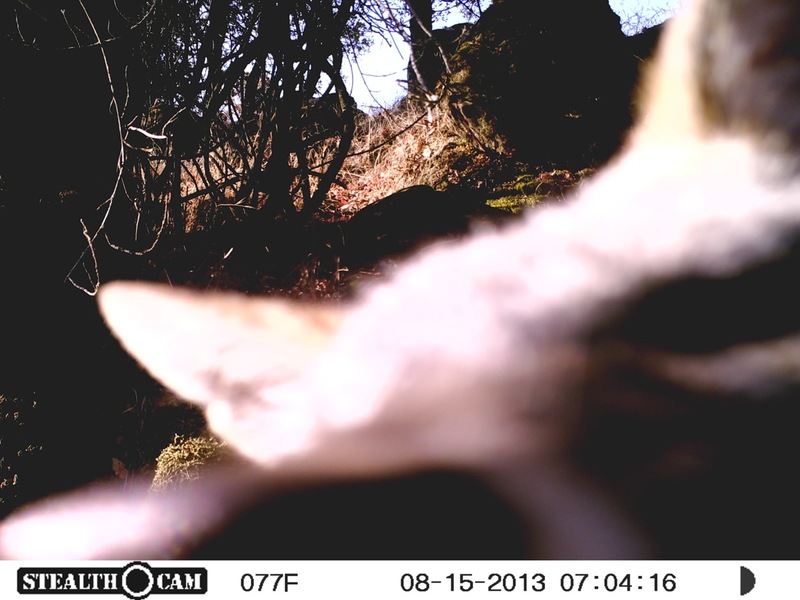 Here is a humorous photograph of a coyote checking out the camera on the 15th of August…. Sally and her kit on August 24, 2013. Since it was late afternoon, we stuck around and quietly waited to see them when they emerged in the evening. This is the mom – Sally – as she checked out the surroundings before coming out of her den – note her ear tags. Sally’s kit taking a look around before coming out of the den. The kit on the right checking out Sally (mom) on the left as they emerged from their den. Here is a movie of the kit at the den site…. I really hope that one of the young ringtails dispersed away from Sally early and therefore wasn’t with her…but there is also the potential that something worse happened to the youngster. But, we definitely have one of the kits still with mom. Will update this further as I get more data….